Bhopal, April 30, 2017 (Abdul Ahad Farhan): Chief Minister Mr. Shivraj Singh Chouhan has said that globalisation is in Indian soil and India has shown the path of globalisation to World even before. The country has all qualities which are needed to lead. India’s credibility and presence has been felt strongly across the globe under the leadership of Prime Minister Mr. Narendra Modi. We have rich capital of policy, decision and intention which makes us capable to lead the world in the era of globalisation. Mr. Chouhan was addressing annual session of Confederation of Indian Industries (CII) in New Delhi on ‘Future of Globalisation- can India lead?’ today. 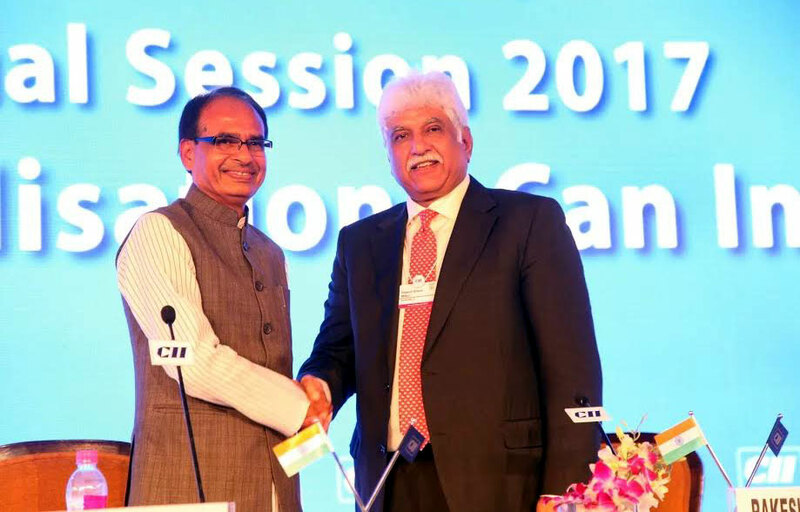 Mr. Chouhan said that India has emerged as a global leader. Policy paralysis has ended in the leadership of Prime Minister Mr. Modi. Avenues have been opened up for foreign investments in many sectors. The country is changing following historical and revolutionary decisions like Digital India, Stand-up India, Start Up India, demonitization and implementation of GST. Madhya Pradesh is moving forward altogether. Mr. Chouhan said that cabinet committee has been constituted by Madhya Pradesh Government, which will soon approve investment proposals. Investors have no difficulties in getting approval on their proposals. Many positive decisions have been made under ‘Ease of Doing Business’. Mr. Chouhan invited investors to the state and sought suggestions from them. Mr. Chouhan said that Madhya Pradesh was having tag of BIMARU state in the year 2003 when we came into power. The issues BSP (Bijli, Sadak and Pani) were the core issue which brought us into power. Electricity used to come for a few hours and there were no roads and problem of drinking water prevailed as well. Now, Madhya Pradesh has network of 1.25 lakh km roads. Energy capacity has reached to 19,000 MW from 4000 MW. Madhya Pradesh is now power surplus state. Madhya Pradesh has achieved new heights in solar power production. World’s largest solar power plant having capacity of 750 MW has been set up in Rewa which will provide electricity at Rs 2.97 per unit. Irrigation area has increased significantly. There are 40 lakh hectares irrigated lands in the state and because of this, several significant works have been made in agriculture sector. The state has been awarded Krishi Karman Award consecutively fifth time. Full efforts have been made to make agriculture a profit making business. New policy has been rolled out for food processing units.